1Find a feed from any news source. You find these by searching for news feeds followed by whatever source or criteria you want to use (such as news feeds sports or news feeds NPR). 2Copy the URL for the feed you select. URLs for news feeds begin with feed://. 3At the RSSinclude home page, click the Start button. 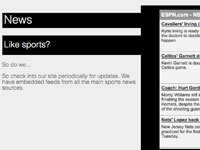 Choose one of the templates for presenting an RSS feed. Opt for one close to the style of your own site. 4Click the Create Now link next to the template. Paste the URL for your news feed into the Add Feed box and then click the Add Feed button. 5Click the Content and Styling Options tab, and choose fonts, colors, and other options for how your RSS feed will display in your site. Do your best here to match colors and fonts with your site. 6Click the Save and Preview button (at the bottom of the page). This saves (and previews) your selected options, but you haven’t generated code yet. 7Click the Include tab. Here you can choose from a set of options for how you want to include the RSS. 8Copy and paste the generated HTML into the body element (the visible part) of your own web page. Generated code appears in a box on the bottom of the page. 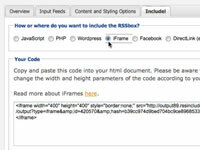 9Add, edit, and fine-tune your own HTML and CSS so that the embedded RSS feed meshes nicely with your page seamlessly. 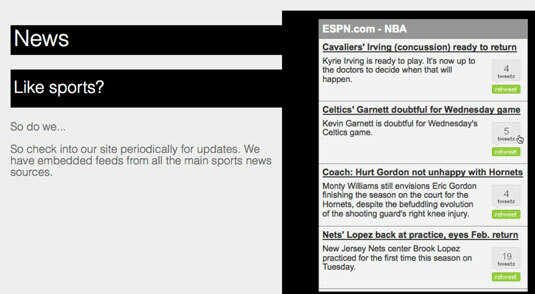 The feed is embedded in a page with associated content and will update whenever the new source updates.